Yukina Izumi, a girl batting fifth and the catcher for “Kanegafuchi Eagles”, led the Tokyo team to win the second 15U Japanese National Rubber Baseball Championship held in Shizuoka Prefecture from September 23 to 25, 2010 Yukina is the third daughter of the team’s Manager Kenichi Izumi (44). She started playing baseball before entering primary school and calls her father “coach” at home. 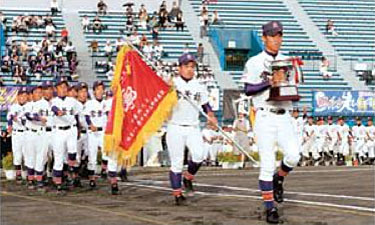 The Championship with 33 teams participating in Japan, was delayed by six months due to the 3/11 earthquake and tsunami disaster in northeastern Japan.